Successfully Added Mini Multimedia Projector with Micro SD (2 GB) to your Shopping Cart. Innovation has a new name - Mini Multimedia Projector with Micro SD card slot and 2 gigabytes of internal memory. 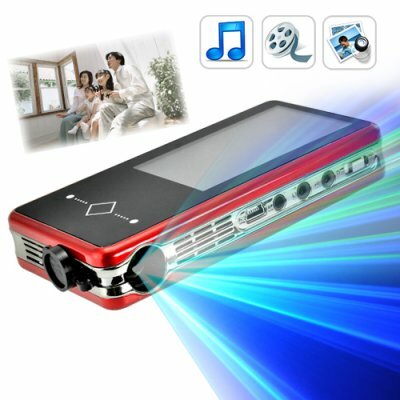 This baby brings together all the functionality of a first class MP3 / MP4 player with a top of the line mini projector! This revolutionary player projector is no bigger than your average cellphone! But it performs like a complete entertainment system. It's got 2GB internal memory and can accommodate TF / microSD cards for 8GB more external memory. Where this product really shines however is all the display options it affords you to watch media on the E87's stunning built-in 3 inch LCD screen or project images on a wall or screen for up to 60 inches of display brilliance! The E87 is also an outstanding mini multimedia projector. It has AV-IN functionality that allows you to input a video source such as a game system or DVD player to the unit and then project it for big screen entertainment. Best of all, you have the choice of either power adapter or built-in rechargeable battery to keep the show going! Portable, powerful, and well-priced - Order your Mini Multimedia Projector today and we'll ship it out tomorrow. Volume control is achieved within the menu system. Videos should be 640 x 480 in resolution for ideal operation. I'm not good with measurements. Can you compare this mini MP6 player projector's size to something I'm familiar with? No problem. Take that iPhone out of your shirt pocket. It's that big. A little thicker, but yeah you get the idea right? on 2010-10-14 19:56:22 Small, easy N great! A good projector for the mobile worker. Yes, it needs a dark room. Yes, the quality is ok but you pay what you get. I think this mini projector does its work the best way. If you want to watch a movie in perfect display in a semi dark environment, buy a BIG projector. If you want to watch film on a wall Anyware and still carry everything with you. BUY THIS Mini projector! I received my projector in 5 days and it works great! It does what it says,battery lasts like 3-4 hrs for video or you can leave it plugged in to a wall socket or lap top usb! Great product! Only wish it had a camera,it could project the desktop, oh and pdf reader instead of txt. :P but its asking a bit much ,this product does it all almost! on 2010-05-19 01:20:47 Just what I expected! Nice! This is a very portable device, as MP4, it works quite well, moving 640x480 divX without any trouble (just need to find the correct codec). As picoproyector, it works just as expected, in complete dark you get a sharp video image up to 1'30 wide. In penumbra you will need to be closer to the wall, but you can get the size of a 17 inches screen quite bright and clear. Concerning the focus, I agree with other reviews, it's tricky but perfectly workable. This is just what I expected, I use to travel a lot, and now I have my 50 inches screen which I can see in any hotel room, while taking a bath, or even proyected on the ceiling while in bed. And, as my mobile phone uses MicroSD, I can easily show to my friends the photos taken with my phone in a proper size! First this is, never going to be as bright and sharp as a "full" size projector. But the idea is portability, i have had other pico projectors, this one is by far the best. Its MUCH brighter than others, OK, still needs a dark room. But is very watchable. Projecting onto a white wall, i had an image 120cm high that was not that bright, but acceptable, a 60cm high image is bright and clear. The focus slider is a bit of a challenge getting It perfect, BUT is workable. Where this projector is miles ahead of others is that it plays .Avi files without having to use stupid conversion software, simply drag and drop either onto the internal memory or the micro SD card slot.